I had a chunk of very good beef sirloin and a head of fresh farm picked broccoli in hand. What would I do with them? Beef and broccoli stir-fry, of course! This is one of the most common beef stir-fry dishes that people order at Chinese take-out. It is very easy to prepare at home with ingredients you might already have in your pantry. First, make sure the beef is thinly sliced and marinated with soy sauce, a little brown sugar, and corn starch for 15 minutes. Meanwhile, cut up the broccoli and onion. 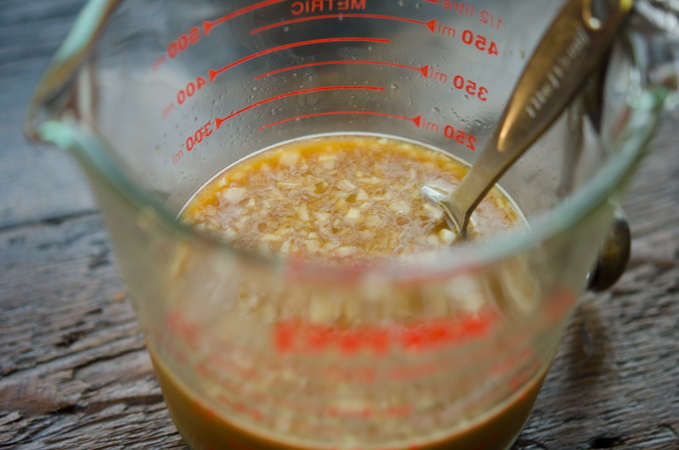 Prepare the sauce in a separate bowl with soy sauce, oyster sauce, chicken stock, garlic, ginger, sugar, and corn starch. Stir-fry all together and your dinner is ready to serve. 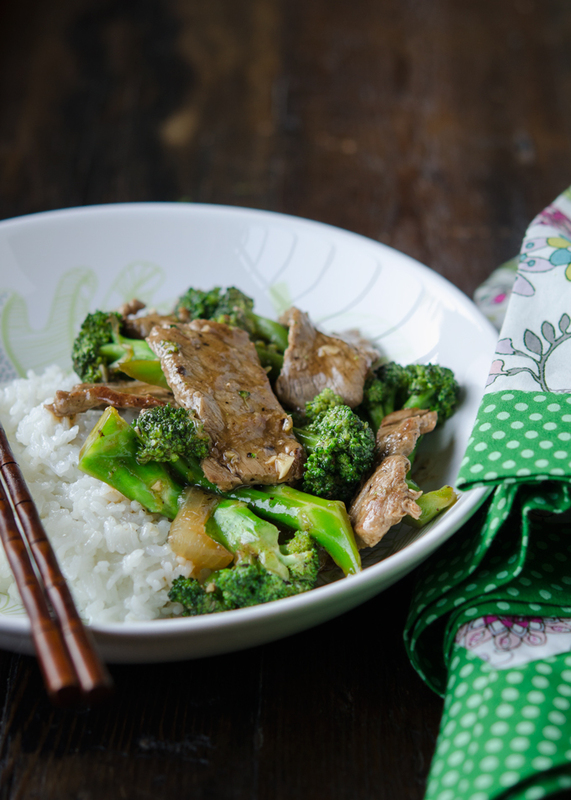 A delicious and healthy Asian dinner less than 30 minutes! How about that? Now I think I just gave you full instructions on how to make the dish and I feel like this post should end right here! Here is the recipe tutorial in case you need it. Slice the beef thinly against the grain. 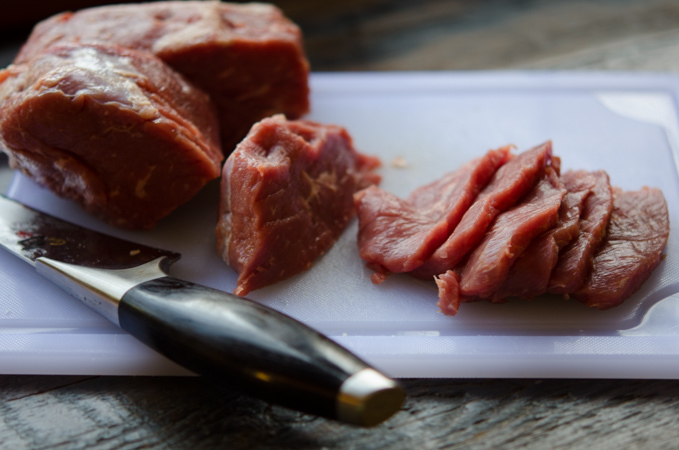 Use a tender cut of beef, such as sirloin, rib-eye, or strip-loin steak cuts. Season the meat with soy sauce, brown sugar, corn starch, and rice wine (if you happened to have any). Toss well together and set aside. Cut up the broccoli. I don’t throw away the stem. Peel the outer fibrous layer off and you will get the tender core inside. It is delicious! Also slice 1 small onion as well. In a bowl, mix chicken stock, soy sauce, oyster sauce, minced garlic, minced ginger, brown sugar, and corn starch. Set aside. Heat oil in your wok or skillet so that it is very very hot (high heat). It is important to stir-fry with a very high temperature. Throw the beef in and stir-fry just until they brown. 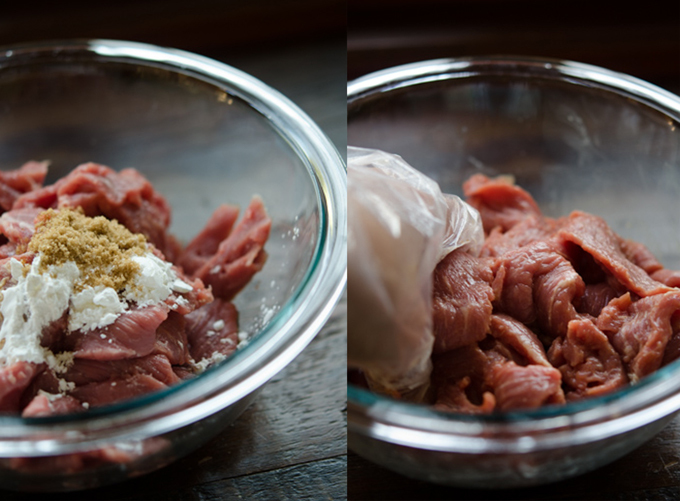 The sugar in the marinade will help to caramelize the surface of the beef nicely. Transfer the beef to a plate and set aside. 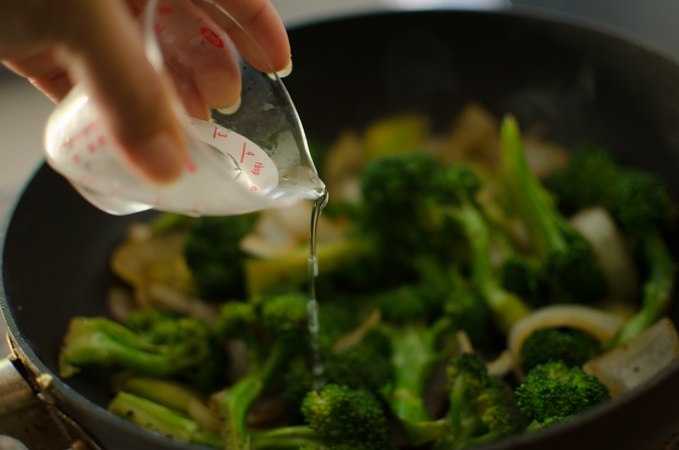 Drizzle more oil in a wok and add the broccoli and onion. Stir-fry for a minute. Make sure you are retaining the high heat. Add about 2 tablespoons of water to create the steam. Cook the broccoli until they are crisp and tender. Add more water if needed. Return the beef to the skillet and pour the sauce over everything. Continue to stir-fry until the sauce gets thickened, which should take about 1 minute. 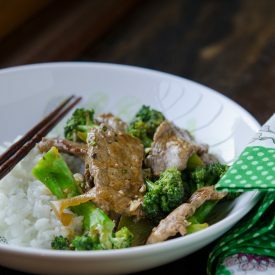 You can serve this beef and broccoli stir-fry over rice or noodles. I chose rice because it is the staple in my household. 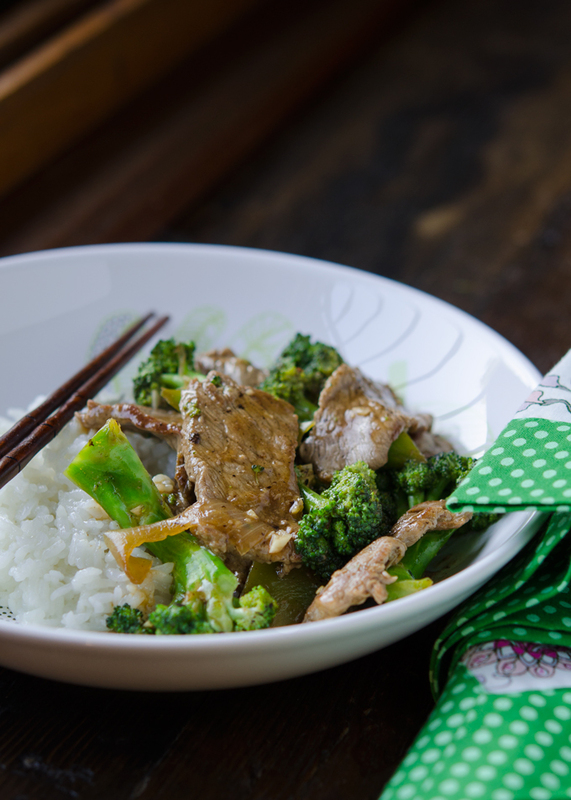 You will love the tender beef, and the just-right crisp and tender broccoli. Yum! A delicious meal doesn’t have to be so labor intensive, right? The handy-dandy printable recipe is below. Enjoy! 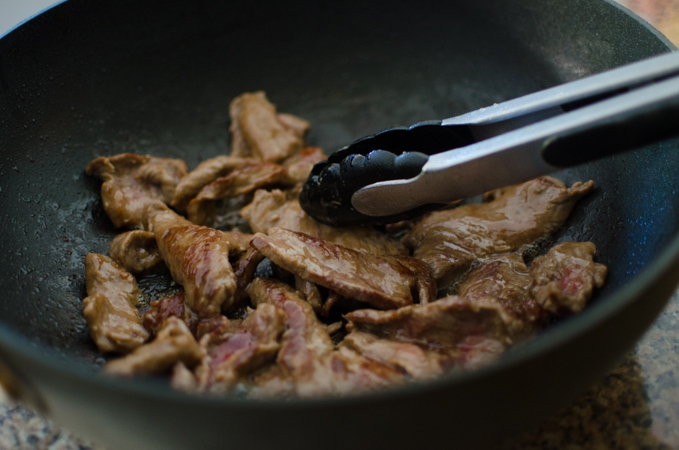 In a bowl, combine beef slices with 2 teaspoon brown sugar, 2 teaspoon cornstarch,1 tablespoon soy sauce, rice wine. Toss well to coat and let it sit for 15 minutes. In another small bowl, mix all the sauce ingredient, and set aside. Heat 1 tablespoon of oil in a wok or skillet over high heat until very hot. Add the beef and let it sear for few seconds, then stir-fry until they are just browned. Transfer to a plate and set aside. 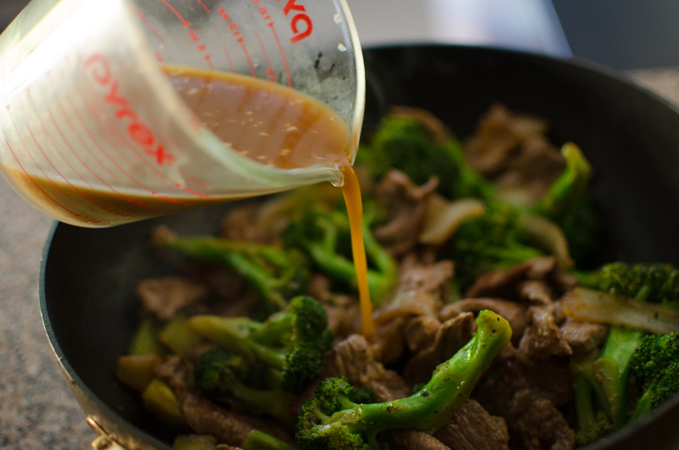 Heat the rest of the oil in a wok until hot, add broccoli and onion, and stir-fry for 1 minute. Make sure to maintain the high heat. 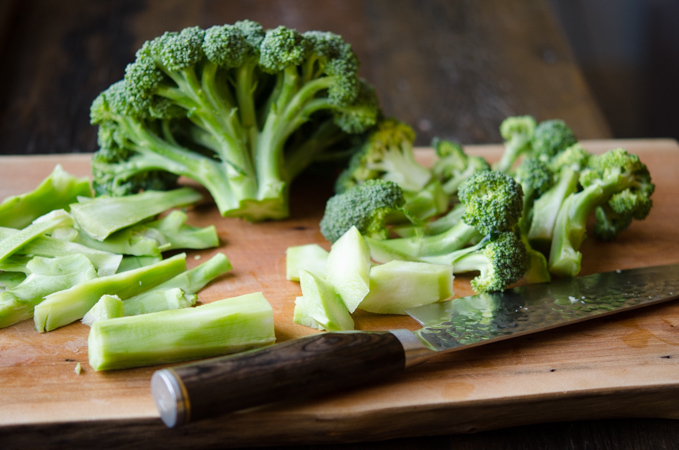 Add 2 tablespoon of water to create the steam so that it can cook the broccoli florets to a tender crisp. Add more water if needed. 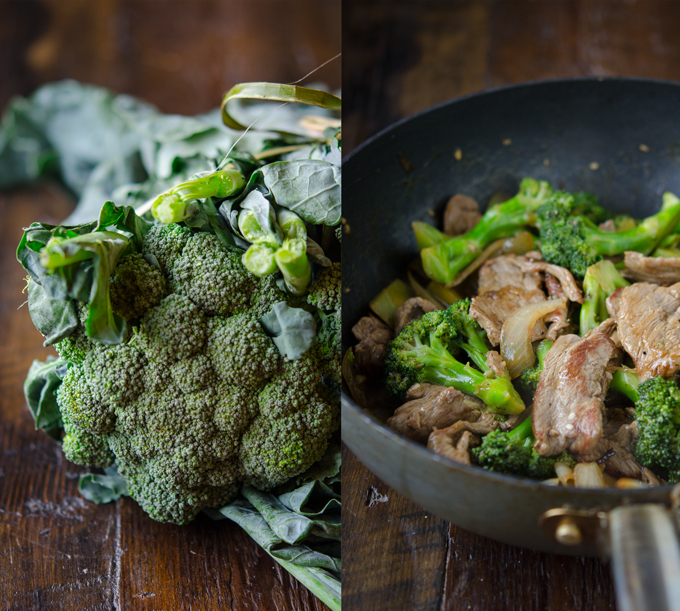 Beef combines so well with broccoli in a stir-fry, doesn't it? One of my favorite combos! Yours looks excellent -- thanks. Thank you for sharing such a delicious recipe! I made it for dinner tonight and it's definitely going in my recipe file! Great! I am so happy to hear that you liked it. Thanks for the comment. Thanks Nagi. I better check on your beef and broccoli recipe, too. I am thinking of an affiliate program as well. Will see. I've tried to find the right recipe for this for a long time. I tried yours and knew I had found the right recipe. Thank you so much. I love your cookbook too! Thanks Kim, I am glad that this recipe was right one for you. What a great recipe. Tastes just like at the Chinese restaurants. I made it for my MIL and she loved it. I've made several of your other recipes too and they've all been great. Thanks a bunch Holly~!! I made this tonight and my husband said, loudly, "this is goooood sweetheart!" Tks for the recipe!